This ancient practice can transform the way you think about food and set the stage for a lifetime of healthy eating. 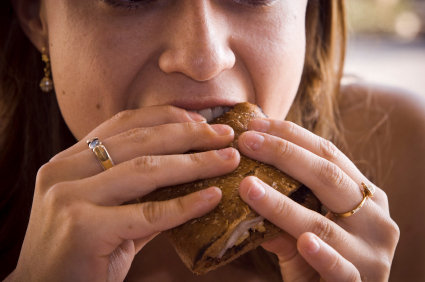 Like most of us, you've probably eaten something in the past few hours. And, like many of us, you may not be able to recall everything you ate, let alone the sensation of eating it. According to a 2011 report from the U.S. Department of Agriculture, the average American spends two-and-a-half hours a day eating, but more than half the time, we're doing something else, too. Because we're working, driving, reading, watching television, or fiddling with an electronic device, we're not fully aware of what we're eating. And this mindless eating—a lack of awareness of the food we're consuming—may be contributing to the national obesity epidemic and other health issues, says Dr. Lilian Cheung, a nutritionist and lecturer at Harvard T.H. Chan School of Public Health. Mindfulness means focusing on the present moment, while calmly acknowledging and accepting your feelings, thoughts, and bodily sensations." The tenets of mindfulness apply to mindful eating as well, but the concept of mindful eating goes beyond the individual. It also encompasses how what you eat affects the world. We eat for total health," Dr. Cheung says. That's essentially the same concept that drove the development of the 2015 pro-posed U.S. Dietary Guidelines, which, for the first time, considered sustainability of food crops as well as the health benefits of the foods. Although the ideal mindful-eating food choices are similar to the Mediterranean diet—centered on fruits, vegetables, whole grains, seeds, nuts, and vegetable oils—the technique can be applied to a cheeseburger and fries. By truly paying attention to the food you eat, you may indulge in these types of foods less often. In essence, mindful eating means being fully attentive to your food—as you buy, prepare, serve, and consume it. However, adopting the practice may take more than a few adjustments in the way you approach meals and snacks. In the book Savor: Mindful Eating, Mindful Life and companion website, www.savorthebook.com, Dr. Cheung and her co-author, Buddhist spiritual leader Thich Nhat Hanh, suggest several practices that can help you get there, including those listed below. 1. Begin with your shopping list. Consider the health value of every item you add to your list and stick to it to avoid impulse buying when you're shopping. Fill most of your cart in the produce section and avoid the center aisles—which are heavy with processed foods—and the chips and candy at the check-out counter. 2. Come to the table with an appetite— but not when ravenously hungry. If you skip meals, you may be so eager to get anything in your stomach that your first priority is filling the void instead of enjoying your food. 3. Start with a small portion. It may be helpful to limit the size of your plate to nine inches or less. 4. Appreciate your food. Pause for a minute or two before you begin eating to contemplate everything and everyone it took to bring the meal to your table. Silently express your gratitude for the opportunity to enjoy delicious food and the companions you're enjoying it with. 5. Bring all your senses to the meal. When you're cooking, serving, and eating your food, be attentive to color, texture, aroma, and even the sounds different foods make as you prepare them. As you chew your food, try identifying all the ingredients, especially seasonings. 6. Take small bites. It's easier to taste food completely when your mouth isn't full. Put down your utensil between bites. 7. Chew thoroughly. Chew well until you can taste the essence of the food. (You may have to chew each mouthful 20 to 40 times, depending on the food.) You may be surprised at all the flavors that are released. 8. Eat slowly. If you follow the advice above, you won't bolt your food down. Devote at least five minutes to mindful eating before you chat with your tablemates. An increasing number of nutritionists and programs offer instruction in the technique, ranging from spiritual retreat centers to hospitals and medical centers. A medically based program may even be covered by health insurance. The website of the Center for Mindful Eating (www.thecenterformindfuleating.org) lists coaches throughout the country.